Brunello di Montalcino is literally a red Tuscan wine made with Brunello grapes (a clone of the Sangiovese grape variety also known as Sangiovese Grosso) from vineyards surrounding the town of Montalcino, located roughly 110 km (70 miles) south of Florence and 40 km south of Siena. In 1980, the Brunello di Montalcino was awarded the first "Denominazione di origine Controllata e Garantina" (DOCG) designation. Today, it remains one of Italy's best-known and most expensive wines, along with its 2 other siblings: Chianti Classico DOCG and IGT Super Tuscan. Montalcino is a small town situated on a hill covered with olive groves and the famous Brunello vineyards dominating the Asso, Ombrone and Arbia valley. The Anania family originally comes from Calabria in the south of Italy and owns a farm that produces "bufala mozzarella" as well as other farm products. Luigi Anania, the owner and winemaker at La Torre, purchased this property in 1977. The estate is located in the commune of La Sesta, approximately 8 km south of Montalcino, towards the town of San Angelo in Colle. The first vintage at La Torre was the fabled 1982 which set a fine precedent for the future work. The original domaine was 5.5 hectares, but several years ago an additional 1.5 hectares of adjoining property was added. The vineyards are planted entirely to the Sangiovese Grosso grape and have a full southern exposure. Wines from three appellations are produced: Brunello di Montalcino, Rosso di Montalcino, and Rosso di Toscano. La Torre Brunello is fermented in stainless steel for three weeks. It is then racked into large oak barrels (called "botte" made by Gargalotto) and left to age in barrel for three years. The wine for the Brunello is selected from the oldest vines and the best vineyards. It is bottled without filtration and rest for a few more months in bottle before release. They also produce a Rosso di Montalcino which is handled just like their Brunello but is aged in large barrels for only one year instead of three. Rarely produced, they also craft a Rosso di Toscano made from Sangiovese resulting in a friendlier, less tannic wine. This wine spends three months in small barrel before being bottled. 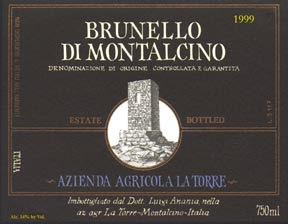 The 2003 La Torre Brunello di Montalcino is a great wine, despite my dislike of the 2003 vintage (overall in Europe). The nose delivers quite ripe dark wild berry aromas (nothing surprising for the vintage) enhanced by great minerality bringing a touch of freshness. After a few minutes in the glass, it opens even more with some slightly floral notes (rose, violette) and more blackberry intermingled with oak hints. The palate is ripe, dark, earthy, woody and a bit tannic. In the mid-palate, the oak notes are quite present yet integrated, pronounced but not hard or dry. The finish lingers with earthy, ripe, oaky, chocolate, moccha flavors. Well made wine overall, with great smooth, ripe, earthy mouthfeel and depth. In conclusion, I need to say that, despite its ripeness due to the 2003 vintage, it also has very good acidity and balance which make it more approachable and drinkable despite its young age.